An all-terrain vehicle is one of the best options for getting around on the toughest of terrains and conditions. While it can be used for work, it is also commonly used for fun which makes it an incredibly versatile vehicle type. 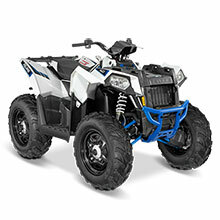 With our selection of Polaris ATV parts, make the most of your favorite vehicle with ease. Our inventory covers a wide range of models and years, so you are sure to find the right part for the job. When looking at the history of the Polaris brand, there is no denying their intrepid spirit when it comes to innovation and design. When they introduced their first all-terrain vehicle in 1985, they might have been a little late to the game, but they certainly brought their stamp of quality manufacturing in their lineup. With the introduction of the Big Boss with a two-stroke engine and six wheels, they changed the landscape of all-terrain vehicles for the better. By the time they introduced their four by four all-terrain vehicle in 1990, they had worked out any kinks with a liquid cooled operation in their Trail Boss 350. A few years later, they would introduce a four-stroke motor which made for even better power and efficiency. Since then, this manufacturer has been steadily improving and innovating to create some of the best models on the market today. In part because of their commitment to new territory and overall quality, we are honored to offer the best in Polaris ATV parts for a wide range of models. Our selection of Polaris ATV parts is one of the largest on the scene to ensure you get the right outcome. With a focus on covering a wide range of models and years, as well as covering just about every part of your vehicle, we are confident you will find everything you need with ease and affordability. We offer OEM Polaris ATV parts to ensure you get the right outcome on matters such as performance, longevity, and overall compatibility. If you have any questions about the products we offer, please contact us for further assistance on the matter.